From time to time this subject comes up and coaches give their insights as to how swimmers really have a feel for the water, how they make it feel more solid and less slippery. More on that later but I wanted to focus more on feeling the water. How it moves you, how you move it and how you can be more in tune with it to make you a better swimmer. While swimming this morning I had a relative novice in the lane with me. Just the two of us in a 50m pool and we were passing at frequent intervals. What struck me was how quiet, smooth and easy it was to swim through the water until I passed the swimmer going in the opposite direction. Suddenly it was like being in the sea. He was pushing a lot of water sideways and forwards. This would have been costing huge amounts of energy and doing nothing to improve his speed as he attempted to shunt his way through the water rather than hide from it. Slipping through and by unnoticed would be the swimmers mentality. You could call us lazy in that to do it any other way would be harder work, This is how swimmers do more of it for longer and faster. In his book, Ian Thorpe, one of the best swim technicians we have seen described how swimming in the public lanes would literally make his skin crawl as the noise, waves and splash would irritate him. At 45secs into this floswimvideo notice how some of the lanes are separated out with 3lane ropes dividing the swimmers. The perks of being an Olympian! 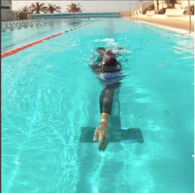 No, we do not all get to train like this and we certainly do not encounter this in open water but to be aware of your pathway through water is a great way to start to think about how to improve your swim technique. Here are some other considerations to help your swim passage and keep it as smooth as possible. Focus with fewer distractions. Add a snorkel to further reduce distractions. Keep the head still and face down while still trying to look forwards with the eyes. Not turning to breathe is a great way to enhance your concentration. A few strokes, if safe with your eyes closed also has you feel your swim a lot more. Swimming in silence.Remove your watch for a part or all of the session. Use your other senses, give them a chance to sharpen up. Listen to your swimming, be aware of the bubbles you are creating, the waves and splashing, imagine the times you are doing, the distances travelled. Holding water, bring the thumb in and allow a few mm of space between the fingers. Sculling is a great way to improve your hold on the water and will make the water feel more solid. The more solid the water feels the easier it will be to hold it and pull the body through it as you anchor the vertical hand and forearm onto it. You work all winter on that ideal catch position, setting an early vertical forearm, pivot early at the elbow, create a great hand shape in ideal conditions and then swim on someone’s feet come race season. I prefer to sit higher up on a swimmer’s hip to avoid the disturbed water at their feet. The catch and drafting are two very odd things in racing, not feeling the water will have you swim slow possibly without realising having drafted someone slower with no concept to your own speed. Hiding from the water. As I swim I hide my hand behind my fingers as they stretch forwards o n entry. My arm behind my hand, try to bring my shoulder into my chin hiding any exposed surface area from the top of the shoulder. Rotating the upper body keeps my hips hidden behind the chest and absolutely key the legs should stay hidden behind. Even aim to hide the toes behind the feet! Once you stretch the arm forward then you break streamline but only with the vertical hand and forearm pivoting at the elbow. 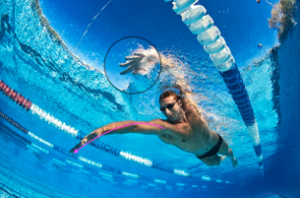 As the hand and arm deepen more of the arm is exposed but you are travelling forwards over the hand if you have retained your streamline minimising the exposed surface are of the arm. 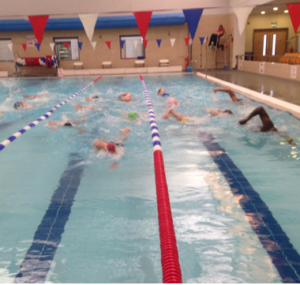 A simple subset we do all year round to help keep swimmers in tune with their stroke includes – 6x50m in a single lane in pairs. Rest until the last paid touch the wall then the first pair head out again. In evenly matched pairs, swim side by side. Maintain even pace for 25m, then the lead out swimmer can go for it. One person previously assigned is the lead out swimmer. 2nd swimmer waits, watches, listens & feels for a disturbance in the water, Looking for the assigned swimmer to break for the wall. 2ndswimmer tries to win the swim to the wall by observation and avoiding being taken by surprise. Change sides in the lane so breathing side adds a further complication. Stop thinking about the water as a barrier to be pushed through and start thinking about all the tiny hydrogen and oxygen components that it comprises and how you might better squeeze yourself through them! It should feel less like you are approaching it like a solid wall. If you attack it with power and strength and no thought to streamline then you will fight it and it will fight back.